Jaeger, Graff, Croft, and Pontillo. 2011. Mixed effect models for genetic and areal dependencies in linguistic typology: Commentary on Atkinson. Linguistic Typology 15(2), 281–319. [if you’re not subscribed to Linguistic Typology, check out this pre-final draft or contact me for an offprint]. This paper is a commentary on Atkinson’s 2011 Science article on the serial founder model (see also this interview with ScienceNews, in which parts of our comment in Linguistic Typology and follow-up work are summarized). In the commentary, we provide an introduction to linear mixed effect models for typological research. We discuss how to fit and to evaluate these models, using Atkinson’s data as an example.We illustrate the use of crossed random effects to control for genetic and areal relations between languages. We also introduce a (novel?) way to model areal dependencies based on an exponential decay function over migration distances between languages. Finally, we discuss limits to the statistical analysis due to data sparseness. In particular, we show that the data available to Atkinson did not contain enough language families with sufficiently many languages to test whether the observed effect holds once random by-family slopes (for the effect) are included in the model. We also present simulations that show that the Type I error rate (false rejections) of the approach taken in Atkinson is many times higher than conventionally accepted (i.e. above .2 when .05 is the conventionally accepted rate of Type errors). The scripts presented below are not intended to allow full replication of our analyses (they lack annotation and we are not allowed to share the WALS data employed by Atkinson on this site anyway). However, there are many plots and tests in the paper that might be useful for typologists or other users of mixed models. For that reason, I am for now posting the raw code. Please comment below if you have questions and we will try to provide additional annotation for the scripts as needed and as time permits. If you find (parts of the) script(s) useful, please consider citing our article in Linguistic Typology. This entry was posted in articles, Papers, Presentations, Statistics & Methodology, statistics/R and tagged areal dependency, Atkinson, Croft, data analysis, genetic dependency, Graff, lmer, mixed models, multilevel models, R code, serial founder model, simulation, typology. While searching for something else, I just came across two papers that should be of interest to folks working with mixed models. Schielzeth, H. and Forstmeier, W. 2009. Conclusions beyond support: overconfident estimates in mixed models. Behavioral Ecology Volume 20, Issue 2, 416-420. I have seen the same point being made in several papers under review and at a recent CUNY (e.g. Doug Roland’s 2009? CUNY poster). On the one hand, it should be absolutely clear that random intercepts alone are often insufficient to account for violations of independence (this is a point, I make every time I am teaching a tutorial). On the other hand, I have reviewed quite a number of papers, where this mistake was made. So, here you go. Black on white. The moral is (once again) that no statistical procedure does what you think it should do if you don’t use it the way it was intended to. The second paper takes on a more advanced issue, but one that is becoming more and more relevant. How can we test whether a random effect is essentially non-necessary – i.e. that it has a variance of 0? Currently, most people conduct model comparison (following Baayen, Davidson and Bates, 2008). But this approach is not recommended (and neither do Baayen et al recommend it) if we want to test whether all random effects can be completely removed from the model (cf. the very useful R FAQ list, which states “do not compare lmer models with the corresponding lm fits, or glmer/glm; the log-likelihoods […] include different additive terms”). This issue is taken on in Scheipl, F., Grevena, S. and Küchenhoff, H. 2008. 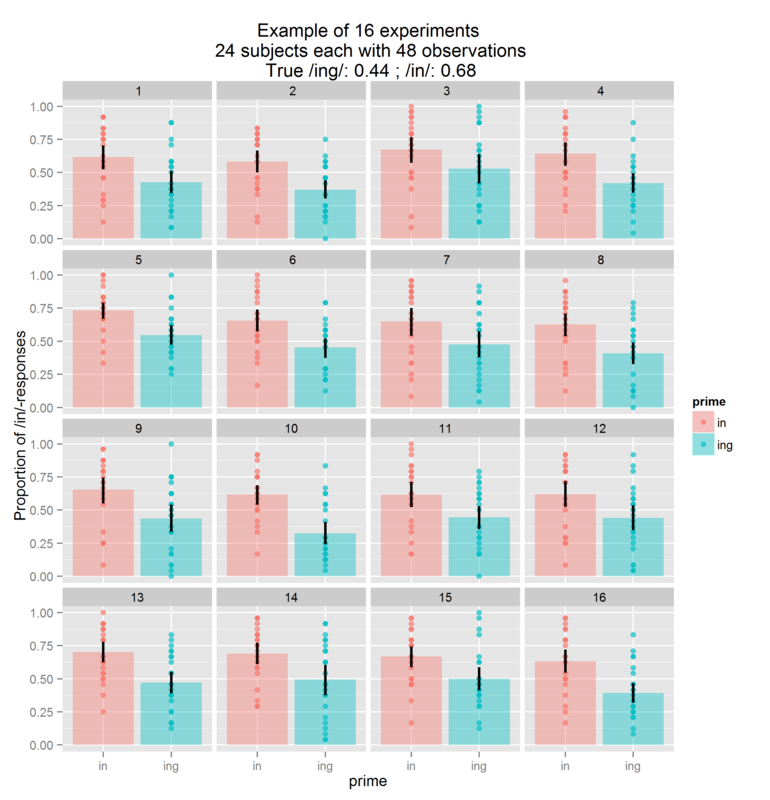 Size and power of tests for a zero random effect variance or polynomial regression in additive and linear mixed models. Computational Statistics & Data Analysis.Volume 52, Issue 7, 3283-3299. They present power comparisons of various tests. This entry was posted in articles, Papers, Presentations, etc., Statistics & Methodology, statistics/R and tagged linear mixed models, lmer, mixed models, power analyses, random effects, random slopes, regression, zero variance. This entry was posted in Statistics & Methodology, statistics/R and tagged collinearity, lme4, lmer, mixed models, multilevel models, R code, vif.